See Kelly Lee in action! This video courtesy of Northwest Benefit Auctions. For nearly 25 years Kelly Lee has performed at hundreds of Benefit and Charity Auctions throughout the country helping to raise millions of dollars for a variety of organizations. These types of events are Kelly's sole auction specialty. 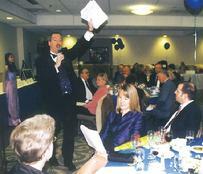 His philosophy is that to be the most effective in conducting successful Benefit and Charity Auctions an auctioneer must dedicate his entire energy towards that field. Due to this devotion, Kelly has developed a unique and entertaining style that captivates both large and small audiences. He has received tremendous reviews for his high energy and boundless sense of humor. Most importantly, he is able to gently capture the hearts and generosity of all in attendance to achieve exceptional financial results for his clients. NOTE: Kelly Lee for nearly two decades has been an active member of the Washington Auctioneers Association (WAA) as well as the National Auctioneers Association (NAA). These organizations have built a strong reputation for attracting the best Auctioneers in the industry. WAA and NAA Auctioneers commit themselves to the highest standards of professionalism, expertise, and business ethics. Though Kelly has been a strong advocate for these outstanding associations, he has chosen as of late to not continue his membership in either of these organizations. The costs of time and money to remain involved have become prohibitive. This is especially so due to the NAA's decision to certify Auctioneers as "Benefit Auction Specialists" (also known as "BAS") with merely completion of a 3-day seminar. Auctioneers such as Kelly with over 20 years of exclusive experience in the Benefit Auction industry are required to take and pay for this 3-day seminar in order to be considered "Benefit Auction Specialists". Furthermore the NAA requires these same Auctioneers to pay for annual "recertification" training in order to keep their "BAS" status. It's Kelly's opinion that the NAA created this designation simply as a new revenue stream for the organization. Little thought went towards the quality of training to the Auctioneers or the value of its implementation to the general public. It's just common sense that a simple 3-day course can't possibly take the place of decades of experience and knowledge in this important field. Requiring Benefit Auction pioneers such as Kelly to pay for "BAS" certification and then expect annual "recertification" payments on top of standard membership fees is simply not in the best interests of these pioneers or the clients they serve. For them to then have to pass down the costs of this added "certification" and annual "recertification" is also not acceptable. That said Kelly has withdrawn from these associations so he can spend more time ensuring his clients receive the ultimate benefit auction consulting and auctioneering experience at the most competitive cost possible. Kelly wishes the best to the fine auctioneer members of the NAA and WAA.